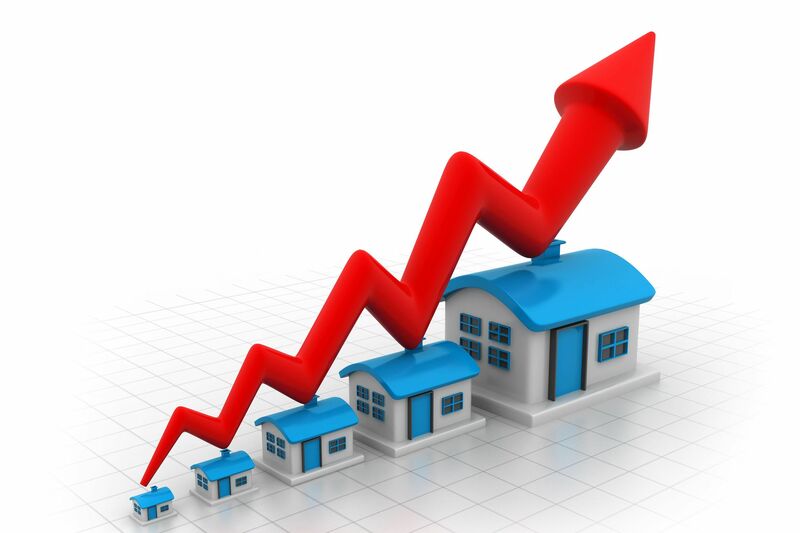 The Phoenix housing market has seen stable growth over the last several years. This stability has been a welcome change from the turbulent times that are still fresh in everyone’s mind. The housing market in the phoenix area started growing at unsustainable rates in 2005, this unsustainable growth eventually lead to a collapse in 2008 that caused the housing crisis and great recession. The phoenix area was hit particularly hard during the recession. Since 2012, we have seen a very different picture, instead of huge rises and crashes the market has seen steady sustainable growth. Recently however, Troy Reeves and “The Reeves Team” have started getting questions on whether or not we are starting to enter another bubble. So, are we entering a bubble? Or are we just suffering from a case of recency bias that is making homeowners, and potential buyers nervous that the past is doomed to repeat itself? To answer these questions let’s start by taking a deep dive into some of the metrics that determine the health of the phoenix housing market. 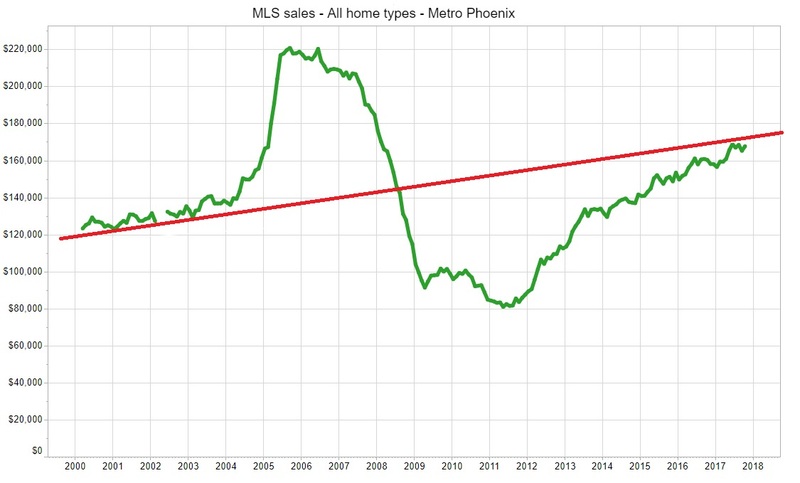 We will start by looking at the Absorption rate of homes in the Phoenix metro area over the last 12 months. Absorption rate is a very important statistic to measure the health of the overall housing market. The absorption rate is calculated by looking at the current number of homes sold in a month versus the number of total homes on the market. The result is the total amount of months it would take to sell out of the current inventory. Three months is the ideal number for a healthy housing market. We were around the 3-month mark in March of 2017 however we have been dipping under that number since that point. So, what does it mean that our absorption rate has been steadily under 3 months? The biggest takeaway is that there is not an ideal supply of homes on the market to meet the demand from the buyers looking to purchase a home. This points to a rise in housing prices in the short to medium turn. While the current absorption rate is not dramatically under the ideal mark if it continues lower look for even sharper price movement upwards. If you are looking for additional insights into the absorption rate and what it means for your housing situation please reach out to “The Reeves Team” for an even further in-depth analysis. Next let’s look at the most straight forward metric of them all, price. While price may not give us as good of a gauge of what’s going to happen in the future as absorption rate, it gives us a great idea of what has happened in the past. While the past in real estate doesn’t necessarily repeat itself, it does often rhyme. So what does the price analysis over the last 12 months tell us? The biggest take away is that we have a great deal of stability in the market. Unlike from 2005 to 2012 these lines are fairly smooth instead of having huge spikes upwards and huge drops downward we have slow sustainable growth. As you can see towards the end of the chart there has been a recent uptick in the median listing price and in the median sales price, this is to be expected as we continue to see an absorption rate of under 3 months. As a side note this pricing graph demonstrates something we at “The Reeves Team” always explain to our clients. If you want your home to sell quickly and for the highest possible value, it is important to price your home correctly when you put it on the market. Look at how close the <strong>new median list price</strong> and the <strong>sold median list price</strong> are. This tells us that the homes that are priced correctly are selling and the homes that are overpriced are sitting on the market. In the Phoenix housing market buyers have options so it’s important to be competitive if you want your home to sell for top dollar. If you are interested in putting your home on the market or just want to have an idea of how much your home is worth, contact “The Reeves Team“. Next up let’s look at inventory. Inventory is a measure of how many homes are on the market, versus how many are being sold. As with price you can see that the number of new listings and sold listings are very similar. What is striking about inventory going into 2019 is how stable is has been since the housing market started recovering around 2012. Take a look at this article written by “The Reeves Team” in July of 2012. This was one of our most viewed articles ever as you can see by the over 30 comments that were posted when it was written. Troy Reeves correctly predicted that the housing market was returning to normal and that normalcy has continued on until today. The last item we are going to look at before we zoom out to the big picture overview is the Sold Days On Market. This metric takes a look at all the homes that were sold during a given month and averages how long it took those homes to sell. There are a couple of takeaways from this data over the past year. The first takeaway is that the metric has been under 90 days for the entire last year. The Sold DOM under 90 days for a span of an entire year reinforces what the absorption rate told us above, that buyers are wanting homes faster than sellers are listing them. While the margin is not to wide at this point, it is something that could lead to a run up in prices in the short term if it continues to fall. The second take away from the Sold Days On Market is that buyers want to buy homes during the summer. As you can see the days on market dips dramatically during the summer months when kids are out of school. You can expect this pattern to repeat for the foreseeable future. After reviewing the detailed short term metrics we can see that prices and inventory seem very stable, and point to continued sustainable growth. Now that we have looked at the short term lets take a look at the bigger picture and zoom out and look at prices before and after the run up and crash of the housing market. Looking at this chart that began in 2000 and runs to today we can get a great perspective on just what happened and where we are today. First you can see that we had sustainable growth from 2000 until 2005 when the housing boom, fueled by the rise in subprime mortgages, took off. As you can see by the parabolic rise in prices from 2005 and peaking in 2007 these prices were not sustainable. In 2008 the housing prices absolutely fell off a cliff and bounced around at the bottom until around 2012. Its clear to see looking back that during the 2010 to 2012 time period we were clearly in oversold territory and a rebound back to normal prices was needed. This rebound was accurately predicted by Troy Reeves” in November of 2012. To give you some perspective “The Reeves Team” drew a red line that continued out from the original sustainable growth between the years of 2000 to 2005 up until today. What is remarkable is, even with the parabolic run up and huge crash and recession that followed, the market has stabilized back to where it would have been if the slow sustainable growth had continued from the beginning. There are many reasons to be optimistic about the housing market moving forward. The biggest reason to be optimistic, is that it does not appear that we are in a bubble. While housing prices have had growth at a slightly faster than average pace over the last few years, it is mainly fueled by the fact that prices previously were to low and we have been catching up to where we need to be all along. With that being said, it is always a good idea to keep an eye on prices in the future, and if you see another parabolic jump in prices be cautious. However, looking at the data we have reviewed, including the absorption rate, prices, sold days on market and inventory a bubble does not appear to be an immediate threat. Wouldn’t it be great if there were no downside and everything was looking positive? Unfortunately we are not that lucky. Interest rates have been on the rise in recent years and the Fed Chairman Jerome Powell has indicated he plans on continuing to raise them, possibly even increasing the rate at which we see rates rise. So what does this mean for the Phoenix Housing Market? The biggest takeaway is that if rates go up, the amount of money home buyers will be able to finance will go down, as more of their monthly payments will be eaten up by interest. The effects on the rising interest rates may take time to play out, but for now “The Reeves Team” remains cautiously optimistic that we will continue seeing long term sustainable growth in the Phoenix Housing Market. The market appears to have completed its return to normalcy and the deep dive that we did on the short term numbers appears to say the same thing. If you want any additional analysis on the market or your home in particular please reach out to “The Reeves Team“. Let us know what you think of the analysis below! Awesome Analysis on the market. I am hopeful we continue with the slow and steady growth. The huge runups are fun while they are happening, but it never lasts! Hope all you want. The end is nye. Our home appreciated 100% in 4 years….that is unsustainable growth, not slow and steady. Arizona wages don’t support Arizona home prices. You can either hope to god california continues to collapse, because those are the morons pushing the prices up……But soon enough you will run out of Cali home owners in the position to sell, relocate to take a job that pays half in order to buy a house that costs half. The end is nye. As soon as the fed rates spike, this market is bust. You are seeing it already. Mortgage applications are the lowest they’ve ever been in any of our lifetimes….